Emma Pachuta, Director of Programs, oversees all programmatic areas of our organization. 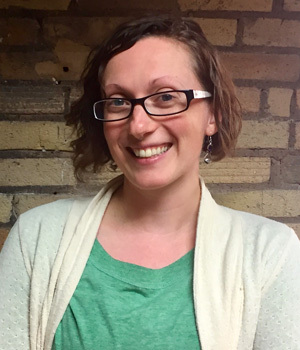 She joined the St. Paul Smart Trips team in August 2011 to develop and manage the Smart Trips Neighborhoods Program, which aims to engage targeted neighborhoods to walk and bike more in their community. Since 2011, the program has engaged thousands of Frogtown residents, both young and old, around active transportation. Originally from a small town in Wisconsin, Emma moved to Minneapolis in 2002 to pursue degrees in Music and Architecture. After studying urban design in Copenhagen, Denmark, she returned with a love of all things transportation-related, and went on to receive a masters in Community and Regional Planning from the University of Oregon. Pastimes include backpacking across continents, year-round bicycling, and cooking large quantities of food for friends.